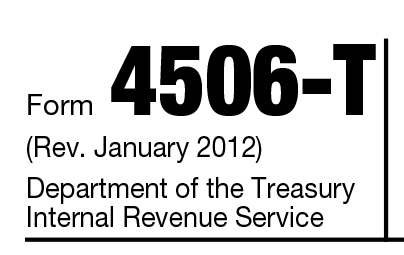 Form 4506-T verification processing with 4UStax.net - US Tax Verification, Inc. Businesses need to be responsive to their clients. Nobody likes to wait. Reducing the time between placing a Form 4506-T verification request and IRS transcript delivery is priority for 4UStax.net. The necessity for fast turn around time is why we have worked to provide next day delivery. The quick processing of a Form 4506-T is a valuable part of income verification. 4UStax.net� specializes in the verification of your borrower’s income and their identity through our Form 4506-T Verification Service. Income as well as identity fraud is currently expanding at an alarming speed. Borrowers are now more adept at modifying tax returns� and income documentation to obtain loans. The fastest and most reliable way to verify income is to compare information provided by borrowers with what the IRS genuinely reports, which is factual. 4UStax.net sponsors the fastest, most consistent, process by maintaining an earnest relationship with all the IRS main data centers. These are located all throughout the country. With this process, and because of the time-savings, it is possible to capture fraud at the pre-funding level.� This can protect lenders from a potential default.